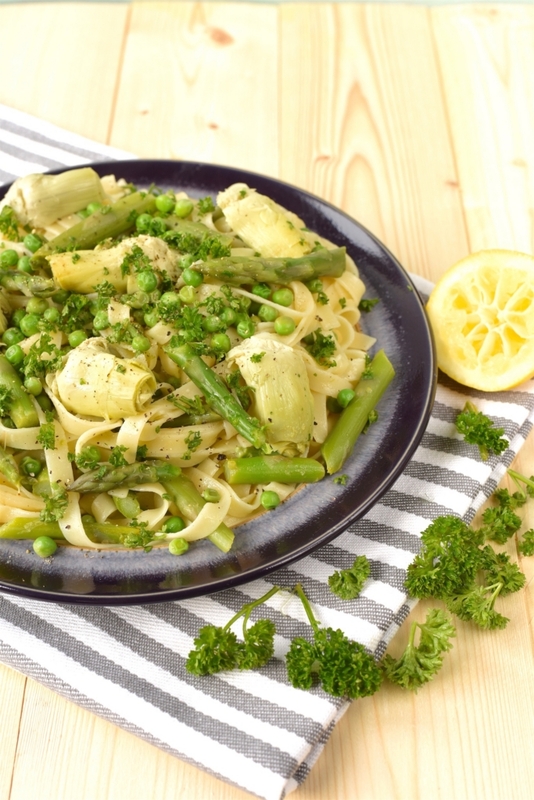 A comforting pasta dish, with all the light and fresh flavours of Spring. 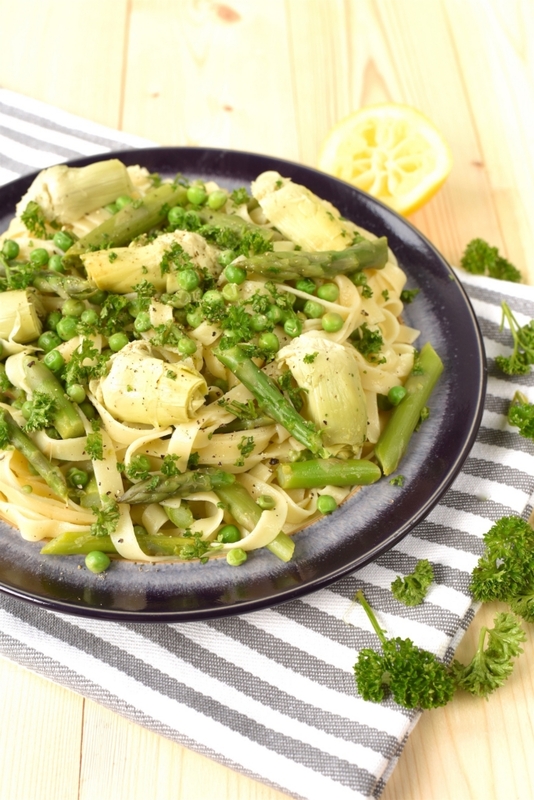 This Spring Green Pasta is full of artichokes, garden peas and asparagus and all brought together with a dressing of lemon juice, olive oil, parsley and black pepper. Spring really is in the air! The sun is shining (I might have just tempted fate by saying that), you can go outside without a jacket, and flowers are in bloom. We can finally start thinking about light and fresh spring flavours and for us that means lots of green vegetables. 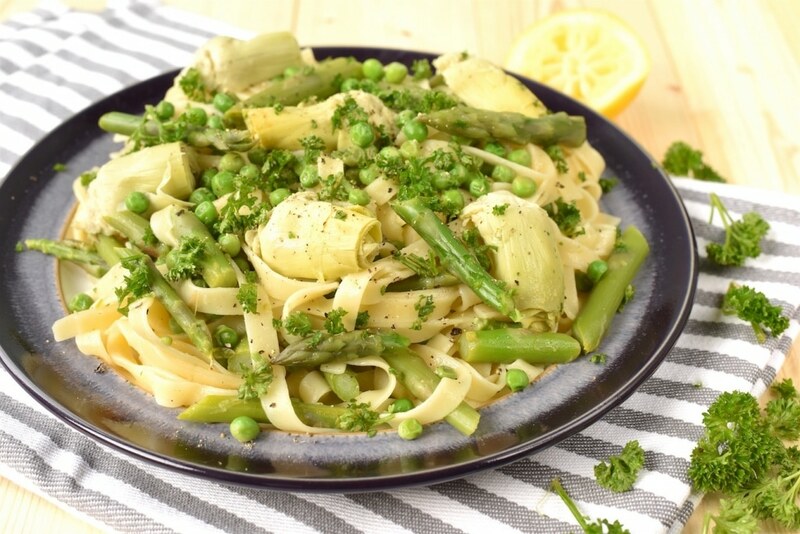 Do you want to be kept up to date on delicious and healthy recipes like this Spring Green Pasta? Please subscribe to the blog mailing list (it takes 30 seconds). You will get the new recipes sent straight to your inbox. Your email address won’t be passed on to anyone and you will never be spammed. Click here to sign up. Today is National Artichoke Day and we think it’s such an underrated vegetable, so we are going to be highlighting more ways to use it other than spinach and artichoke dip. Although we have a healthy recipe for that coming up soon, so look out for that. We have to admit, we don’t usually cook artichoke from fresh, as we have never had much luck with it and we have found some really good canned varieties, so we keep our cupboard stocked up with those to add to pastas and salads. Artichoke has quite a meaty texture, so it’s a good way to fill out vegetarian dishes. Let’s face it, artichokes look a bit weird, but they definitely don’t taste it. Artichokes are mentioned as a food eaten by the Greeks and Romans and they are a really popular ingredient in the Mediterranean, however it was the Dutch that introduced them to the UK in 1530 when they were grown in Henry VIII’s garden and it wasn’t until the 19th Century that they made their way over to the U.S when they landed in Louisiana by French immigrants and California by Spanish immigrants. They still aren’t a hugely popular ingredient here in the UK, well not in every day cooking anyway, and we think that’s just because people don’t know what to do with them. There are a must on any kind of tapas or antipasti platter and they really bulk out a salad without adding too many extra calories to it. 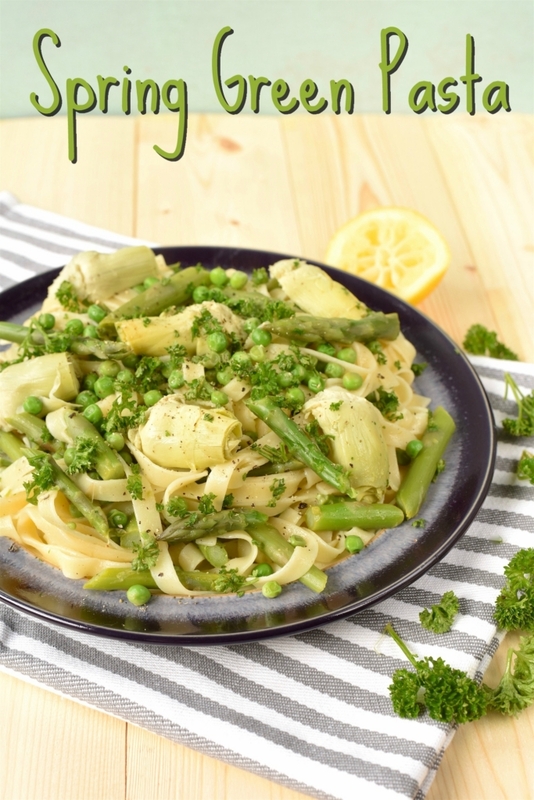 Because the focus on this dish is the green vegetables, we didn’t want to add too much of an overpowering flavour sauce, but the pasta definitely needs some kind of sauce to stop it from being dry. We went with some lemon juice, olive oil, parsley and black pepper and it’s just enough to lift the dish without overwhelming it. But, equally pesto would work really well and add even more green to the dish. 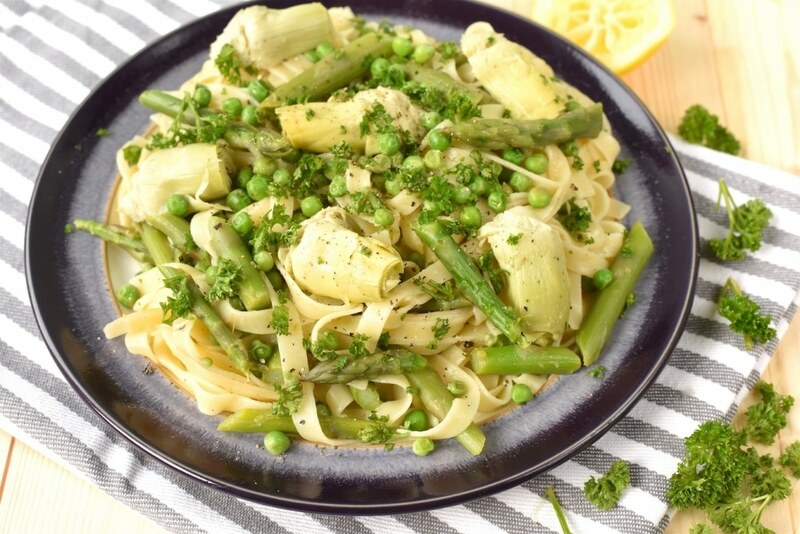 This meal is vegan, but you could easily add some parmesan to it. 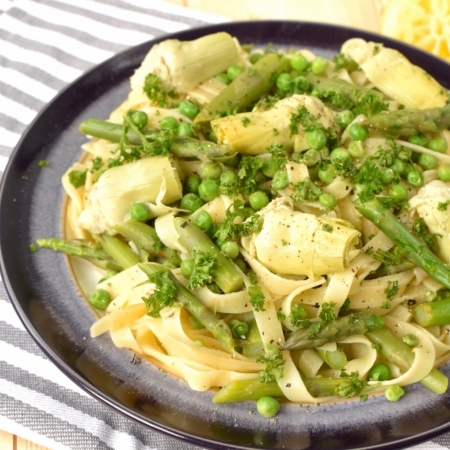 This Spring Green Pasta is full of artichokes, garden peas and asparagus and all brought together with a dressing of lemon juice, olive oil, parsley and black pepper. Drain the pasta and asparagus and put back in to the pan and add the rest of the ingredients. Mix well and serve. Looks delicious, and calories and macro look good as well.